In this project, everyone collaborated with a partner to create a product based on their past memories. The requirement of the product was to have the ability to reflect on one person’s memories while evoking a sense of provocation, with the purpose of making the audience feel uneasy. Firstly, my partner and I started sharing memories between us that would be relevant to the project. After our conversation, I used the notes taken by myself during the talk and organized the information about my partner. After, I came to a realization that she is someone who holds dear to her comforting memories, as she frequently referenced happy times. Examples of her memories included her dumpling eating competition with her family and appreciation for the sounds of nature (i.e. waves & birds) through long walks on the beach. However, melancholic thoughts are also inevitable – such as her isolation from the world in fear of getting hurt. All in all, I think these experiences have shaped her to be the woman she is today. Also, one of the recurring and prevalent themes I observed from her was childhood memories. This was particularly shocking to me, as we often do not remember most of the details of our childhood given that it was more than a decade ago. It suggested to me that, those memories must have been significant to her. On several occasions, she mentioned her regret of not having to appreciate the moment as much as she should have rather, realizing its importance later on in life. The lack of appreciation has made her wish that time could rewind so that she could relive and appreciate those memories more. These ideas prompted me to create a product that explores the theme of the coming of age; focusing on the idea of passing time through audio. 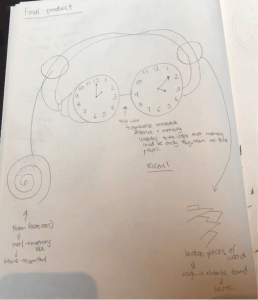 After brainstorming, I decided on including ticking clocks as a symbol of presence. This would remind my partner to live in the now, as we are unable to alter our past. It strives to serve the purpose to remind her that she should start recreating her own memories and learn from her mistakes and start building an awareness for appreciation. 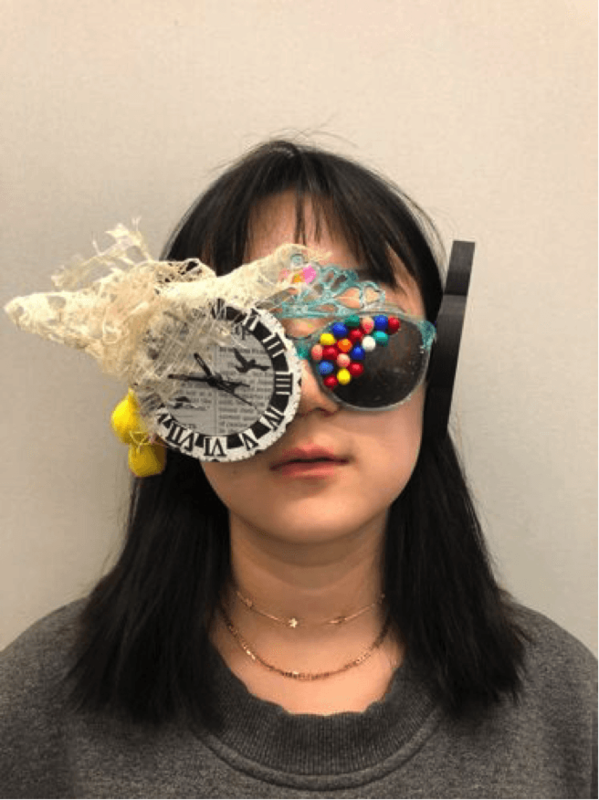 Then, I opted to create a pair of sunglasses with built-in earmuffs and two working clocks. The working clocks would be incorporated at the lens of the sunglasses, essentially blocking her view. This metaphorically suggests that we, as humans, are often blind to the fact that our time is slowly ticking away. I wanted the composition of the clock to be made out of cardboard, as it is opaque and easy to work with. 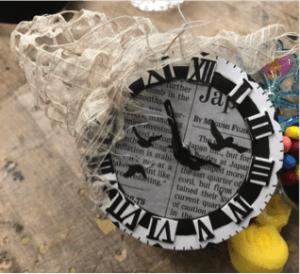 I have also decided to use thin wire to create a connection between the clocks, as it insinuates fragility, and this could mean that there is often a weak connection between our past and present and that memories are often forgotten. For one of the earmuffs, I have decided to combine several pieces of sharp, broken wood that poke out. Sharp wood is often a connotation to block out danger and it demonstrates my partner isolating herself from the world. 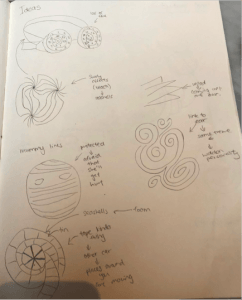 Her disconnection to the world after encountering bad experiences inspired this idea. The choice of material for the other earmuff would be foam. Foam is a type of material that blocks away from the noise and its squishiness, softness, and lack of memory property also implies comfort. With this plan in mind, I bought all of the required materials and started building a test model for my product. Whilst buying the materials, it was particularly challenging for me to find two of the same cheap working clocks but was resolved by changing my product and creating a particular theme of reliving the past while being in the present. 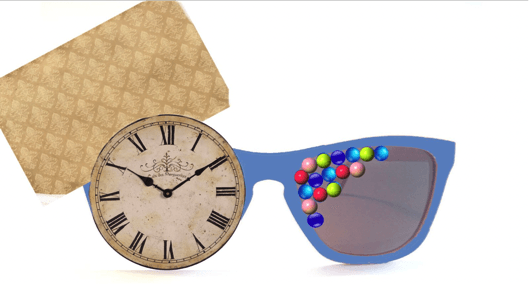 With this approach in mind, I made the decision of incorporating a clock instead of two into one of the lenses, and for the other lens, I stuck the ends of various colored balloons, covering only half of the lens. As balloons are often a connotation to almost everyone’s childhood, I thought it would be a suitable symbol of my partner’s childhood. These balloons, however, only covered half of the lens, and this decision was made to let my partner relive her past while being in the present, as she will be able to look at the surroundings through the other half of the lens. As antiques are a representation of the past, I wanted my clock to possess a similar feel. This led to the decision to make my clock appear vintage by using a sheet of ivory wool and some newspaper. The newspaper acted as the base of the clock and the ivory wool was used to cover a quarter of the clock. Birds were also added back facing the wool on the background of the clock to highlight the loss of time. With the design of the birds flying away from the fabric, I wanted to show that although my partner misses her past, she has accepted the fact that she could never relive it again. For the earmuffs, however, I have only altered the design of the product, and not the materials needed to construct it. 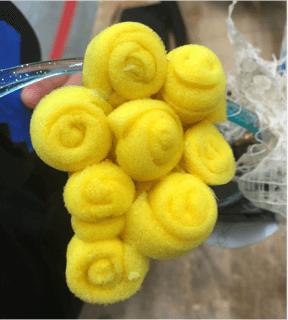 I wanted the foam made earmuff to imitate a shape of a heart, as the squishiness and the noise-canceling ability of the material foam and the heart-shaped design could highlight that my partner’s childhood memory will always remain in her heart. The abilities of the form could also successfully allow my partner to relive her childhood again without any interruption. Instead of having pieces of wood sticking out of the other earmuff, I utilized a wave-like composition to soothe my partner. 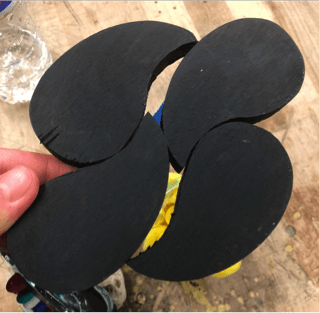 However, black paint was added to the wood. As black is a common color to connote negative things, I wanted to show that even though the present can be soothing, it could also be tough. Thicker wood was also utilized to create a futuristic look. The presentation that I did could be viewed as successful, but only to a certain extent. 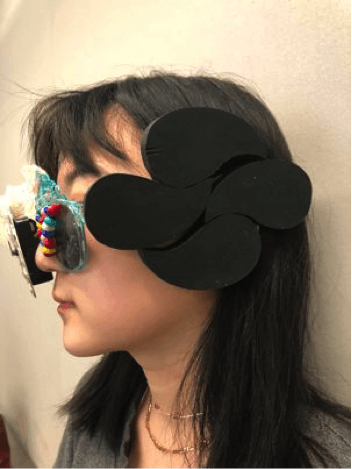 As I was unaware that a presentation had to be done (therefore unprepared), it was difficult for the audience to really understand how each of the components of the sunglasses complimented my partner’s memory. 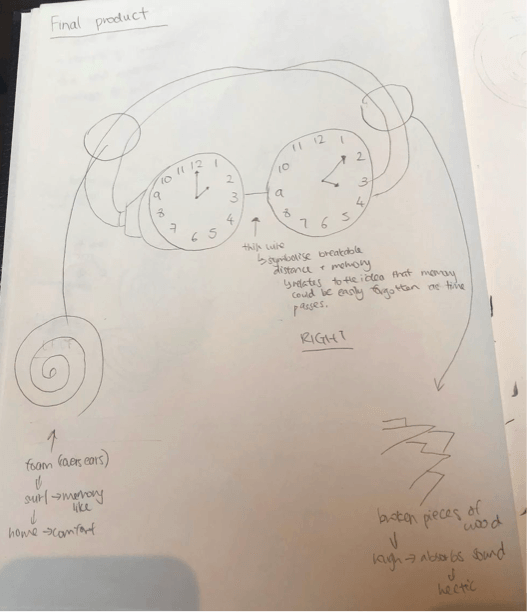 Regardless, I have received compliments on the ticking clock and how the design really stuck to the provocation theme and my partner’s memory. 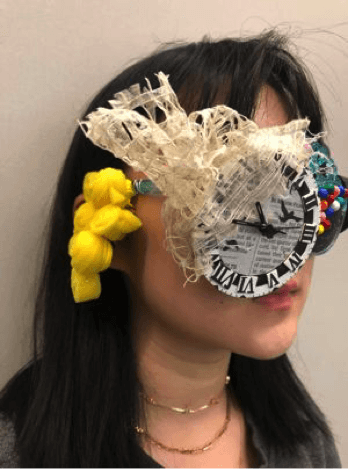 Most importantly, when my partner was wearing this product, she could see the environment while feeling constantly reminded that time is passing due to the ticking sound. Overall, this product could be depicted successful, as it has satisfied my theme and the assignment’s requirements. Although all of the comments that I’ve received are positive, there are definitely some things that I would change about my product. 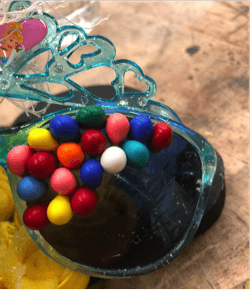 Firstly, it was really challenging for me to attach my foam structure onto the plastic glass and therefore to make my piece more secure and stable, I will utilize a stronger material like wire to link my materials together. Also, I would consider my product’s composition more thoroughly, as my product was unable to sit on a surface properly. In conclusion, I really liked this product, as it represented all of my partner’s memories and could be depicted as a provocative piece. Overall, I have learned a lot of valuable skills that could be useful for future projects and collaborations. As someone who has the tendency of assuming things after hearing a response to an answer, I find that by asking the interviewee whether the assumptions made was correct or incorrect increases the validity and applicability of the product made. This was done very successfully in this project, as throughout the entire interview I kept asking my partner whether the assumptions made were accurate. I would also do more thorough planning before creating and buying the materials needed to create the product as I find myself in a situation where I have an excessive or limited amount of materials to work with. Open communication and an open mind were also one of the insights that I’ve learned in this project, as the lack of judgment definitely allowed my partner and I to exchange our ideas successfully and quickly. The fact that my partner found it tough to recall some of her past memories made it difficult to accurately portray the thoughts in her head. In order to lessen or even avoid this problem in the future, I would suggest in working with more recent memories, therefore, I would be able to craft a more accurate representation of who she is now. If there were a constrained time limit in the future, to counter this, my partner and I would have to actively work outside the parameters of class for a more efficient use of time. What value did you derive from reflecting on your design work in this project? The utmost important value I did derive from this project would be the ability to connect with someone on a deeper level and know about the memories that actually matters to them. Through that, I have learned a lot about her as a person and her culture and traditions – which is something that intrigues me greatly. During the interview session, I have noticed so many great things about her personality that I would not have noticed if it wasn’t for this project. Not only that, at some point during the interview, my partner was struggling to remember most of her memories, and this struck me and made me realize that memories are such vulnerable features of our life that we often disregard. Therefore, I have learned to try to cherish every moment that is currently happening in my life, as I want them to be memorable enough for me to remember.